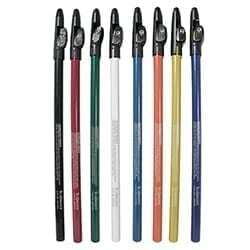 Use to fill in hair art and barber designs, or even create your own free hand designs with these temporary, waterproof and sweat proof hair design pencils. These can also be used to sketch out designs before etching them out. Includes 8 multi-colored hair design pencils. Each pencil is 8″ and has a cap with a built in sharpener. Comes packaged in a reusable pouch.